Like last year, when we moved from Dauphin Island to Gulf Shores AL, I took the car on the ferry while poor Steve had to drive Betsy 85 miles around on the highways (Betsy is too big for this ferry). Arriving at the Fort Morgan ferry landing, I drove straight to Fort Morgan State Historical Park to meet up with Eric and Laurel of Raven and Chickadee, while Steve set up camp at our new site in Gulf State Park across town. As you may recall, we initially met Eric and Laurel a few weeks ago in Apalachicola, Florida. We had no idea our paths would cross again so soon! 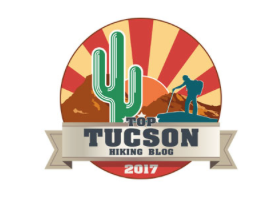 In addition to blogging about our travels, birding and biking are other interests we have in common with them. Since the spring migration of neotropical birds was at its peak here at Gulf Shores, Alabama birding was pretty much the focus of our activities together. OK by me! Eric and Laurel, real birders! 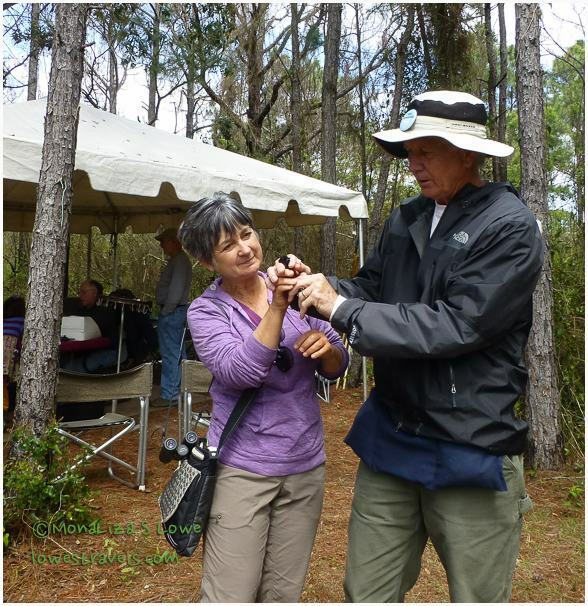 Our first get-together was to observe bird banding at Fort Morgan State Historical Park. 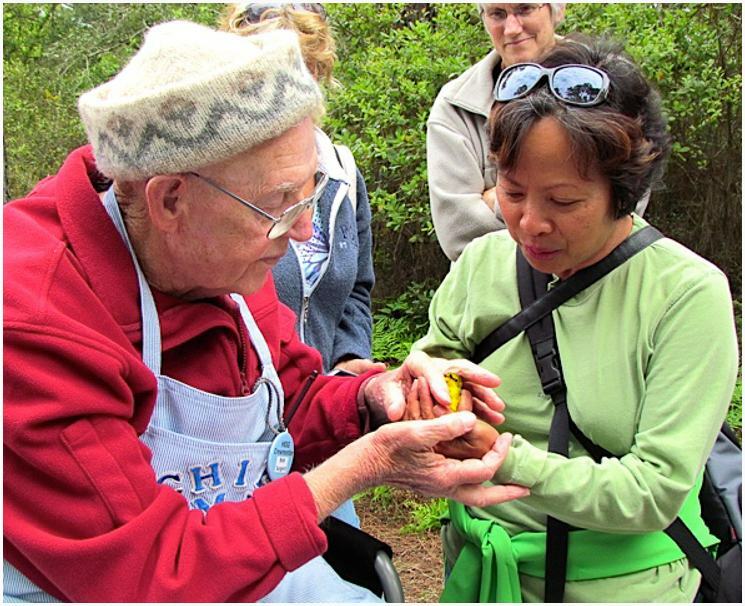 The bird banding sessions are operated by the Hummer/Bird Study Group, which was created by Bob Sargent and his wife Martha. Along with a group of dedicated volunteer bird lovers, they’ve been doing this for the past 20 years. 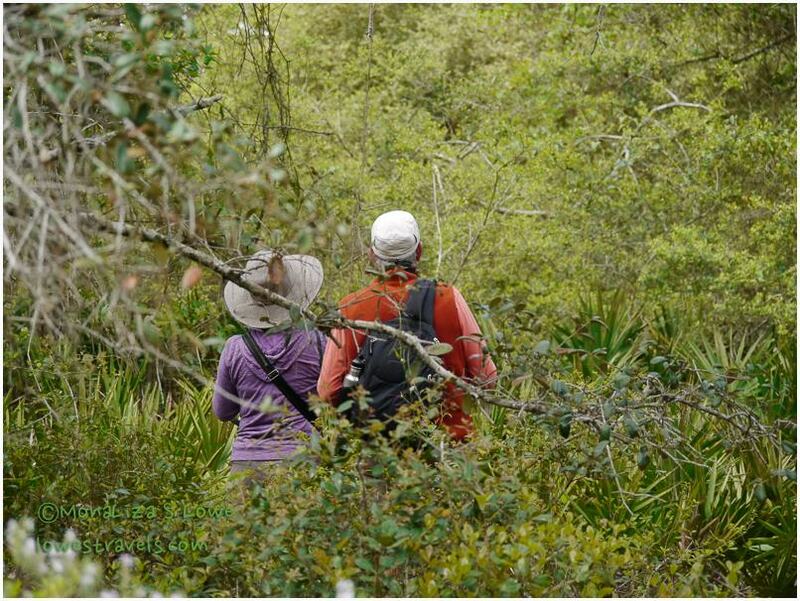 They gather here to band hummingbirds and other neotropical migrating songbirds in order to study and preserve them. 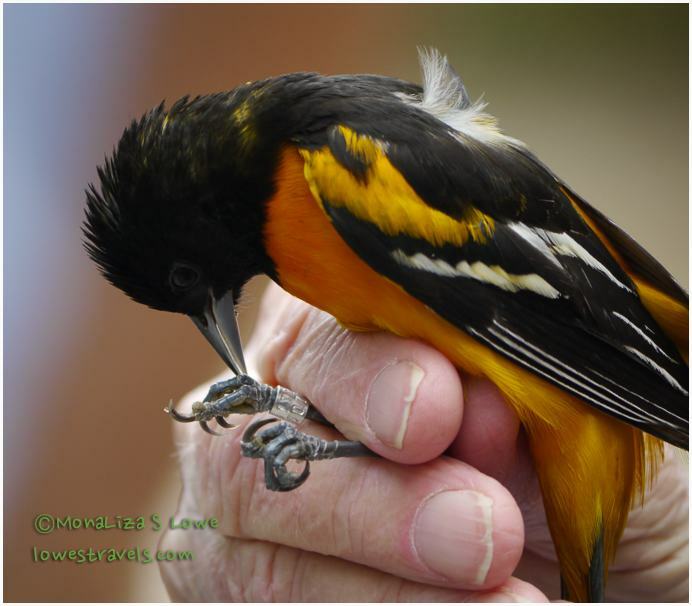 Once a bird is captured in one of the dozens of nets strung through the Gulf woods, it is weighed, measured, fitted with a tiny metal identification band, recorded, given a quick physical, and then released to continue its northward journey. Observing the bird banding was a fun and educational experience. Being able to actually hold and release these beautiful little creatures back to the wild was very exciting for me. Is this awesome, or what? Upon our arrival at Gulf State Park in the afternoon, we were delighted to discover that we were practically next door neighbors. Steve had checked us into site #37, not realizing that Eric and Laurel were at #32. That made our happy hour celebration very convenient! On our second outing early the following morning, I loaded my bike into Eric and Laurel’s truck and we drove back to the Fort Morgan ferry landing to take our bikes over to Dauphin Island. Since I had just come from several days of bird watching there, it was my turn to play tour guide for the day. 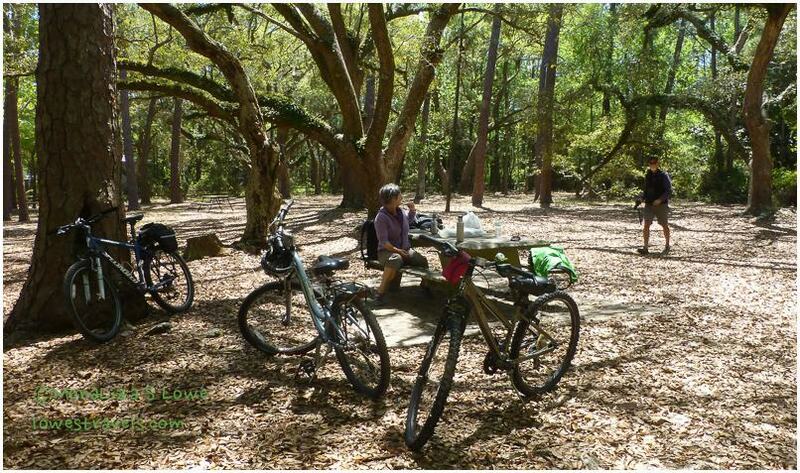 And bikes are the perfect mode of transportation for visiting the birding areas, which are all within a radius of only a couple of miles. 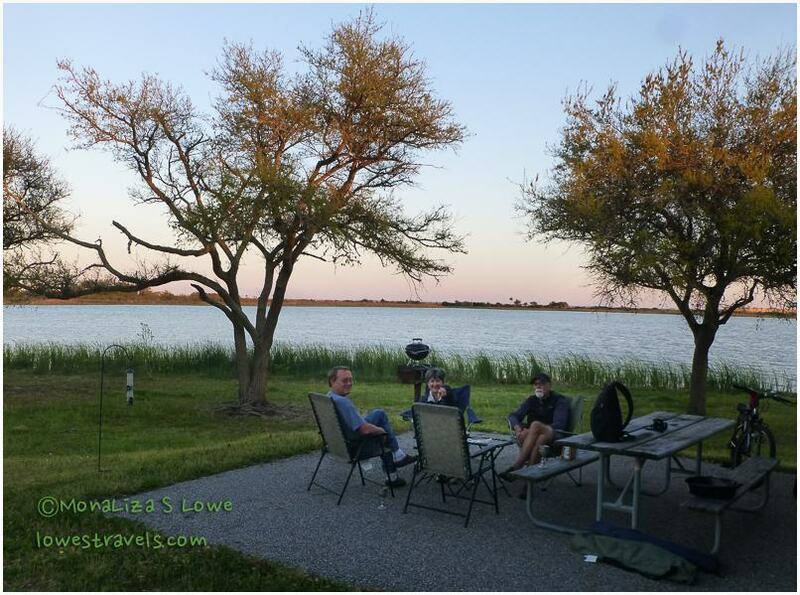 As our time on the island was somewhat limited, we went straight to the birding hotspots; Shell Mound Park, Goat Tree, Cadillac Square and finally to the Audubon Bird Sanctuary. Fortunately, we were also able to catch the Great Horned Owl and her owlets, still at their nesting roost by the beach. While birding with Eric and Laurel I was able to pick up a few tips, like how to identify the many types of Warblers present on the island that day. 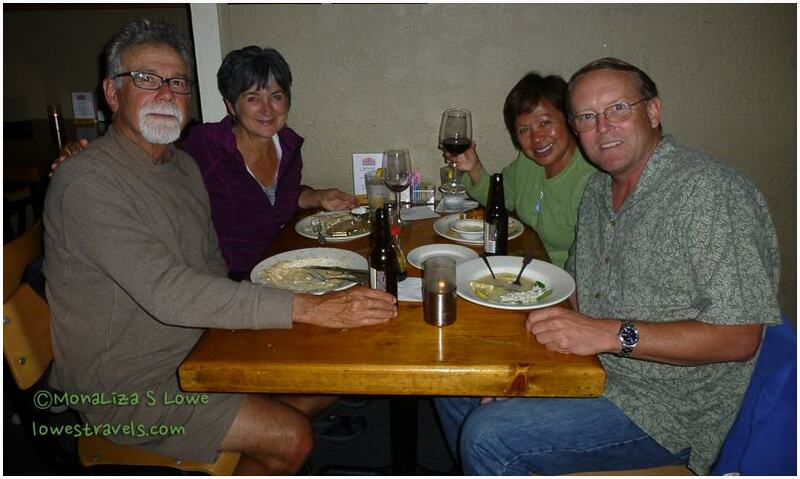 We enjoyed our time together and have planned to meet up again in Texas next winter for more birding adventures. In addition to my initial bird sightings a few days ago, our two days of birding together resulted in enjoying even more of the colorful, cute little jittery creatures. The three of us had a great time traipsing through the woods in search of these elusive migrants. Going with real birders made it all the more fun! Steve stayed home to take advantage of the gorgeous weather and our nice paved parking spot to complete some overdue maintenance under Betsy. We met up with him at the end of the day and went out for a great dinner at the Tin Top Restaurant. I learned during our two days of adventures that Laurel is far more than just a blogger. She is an author of several books including Herbal Healing, which you can check out at Amazon. As an herbalist she is also a columnist and contributing editor for Natural Health magazine. It was indeed a birding bonanza for the bloggers! The smile on your face says it all MonaLiza! Beautiful bird photos. I would have loved to take part in the banding and releasing, it’s always so educational to hang around birders. Agree, I had great wonderful time with Raven and Chicadee 🙂 We have to do this again with Ingrid. Let’s just hope that our schedules will gel this winter. You know who captioned that triple B’s 🙂 love it too. After the storm yesterday, I thought of you and Eric, we could have gone back to Fort Morgan as more migrants have fall out after that big storm. Thanks Ingrid and yes you will be in the loop as we will be where you where last winter. Laurel and Eric are going back to FL and planned to be in Rockport in Nov or Dec. Will see how it goes. It would be fun for the three of us with Eric playing with our binoculars and cameras. Brilliant photos. You are awewsome! Thank you Carol… i had fun playing with my camera capturing those tiny birds. Oh my God Mona Liza! Holding that fragile bird in your hands! I’m so jealous. We’re home now, in a light snow, and trying to set up our bird feeder station to draw the little beauties in. We’ll never have the experiences you have had. Thanks so much for sharing with us. 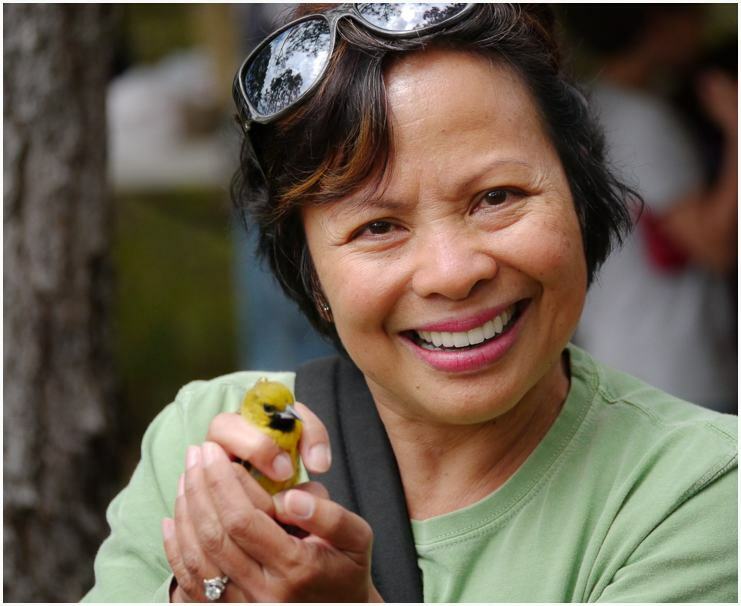 Oh yes Sue, holding that tiny bird was the highlight of our day. Oh what fun! I put this blog on my Pinterst page. We will be in that area in the fall and I am not going to miss this park the next time. What a thrill to hold a hummingbird. You are becoming quite the birding expert. That Painted Bunting is gorgeous! Marsha, despite the spring break frenzy we are ways away from it and enjoying our stay at Gulf State Park. I just hope you can catch the fall migration when you get here. Wasn’t it awesome to hold a bird and in your case a hummingbird! I enjoyed taking those bird photos, thank you Linda. That bird banding session looks really interesting! What a fun stopover. Yes, Lisa it was interesting and informative. We had a great time. John, Im sure there some of these in your nick of the wood in Texas. 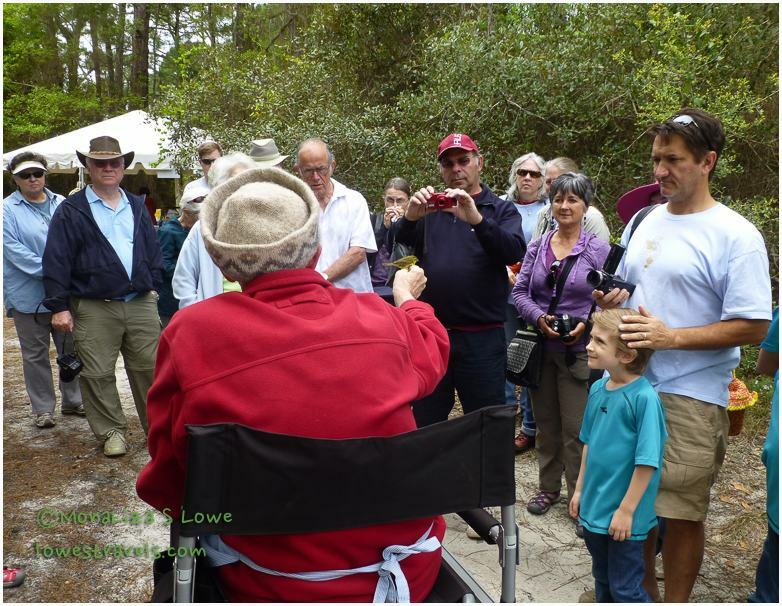 How fun to go birding with those in the know! I hope we arrive somewhere to meet up with Eric and Laurel. I would love to talk herbal health with her. Oh yes, Pam, I had a grand time with real birders 🙂 especially this spring migration event. 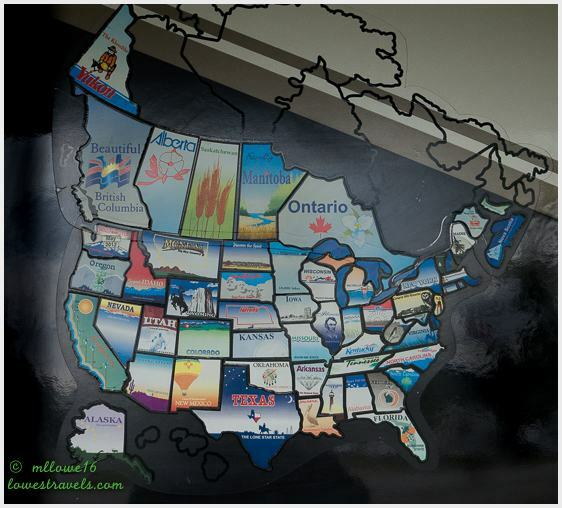 Laurel and Eric are heading out west,(OR/WA) so who knows your paths will cross. Thank you, It was my first time holding a pretty bird, It was pretty awesome. Great bird shots … I’m far from a serious birder, but do enjoy photographing them. Had hoped to go out today, but it’s still too windy … although yesterday’s storm is past now, so that’s something to be grateful for. I would say I am a selective birder, I just want to see the colorful ones and grab a shot. And I perused your blog about your stay here at Gulf Shores last year.